AT&T thinks you are a sucker. Either that, or they want to discourage you from even considering the Samsung Galaxy Note 4 off-contract. At $825.99 with “no annual contract,” AT&T will sell you Samsung’s latest oversized device, the same oversized device that Verizon is asking $699 for. 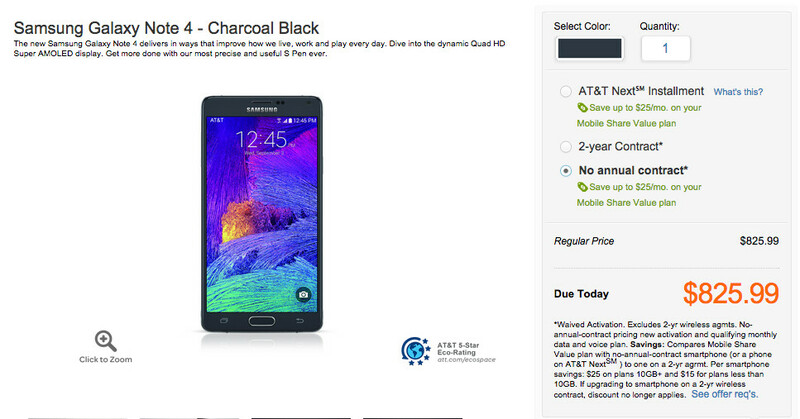 Or that T-Mobile is asking $749 for. They all have the same storage, display, processor, and camera. There are no differences other than the branding on the back. Oh, well maybe you could just go for the AT&T Next pricing, which sits at $34.42 per month, a full $0.57 lower than Verizon’s monthly Edge option? Except that AT&T’s monthly payment plan runs 24 months and Verizon’s runs just 20? Ugh. Seriously, what the hell, AT&T?